Added a new GamePiece class to the project, which represents one of the components that can be placed on the board. I intend for this class to be subclassed for each of the specific types of components (wires, resistors, etc). The GameLevel class represents the game board and the piece queue. I could have created a separate GameBoard class, but I decided otherwise since it is just a 2D array of GamePiece objects. Each GamePiece has a fill value (how many frames until the flow goes to the adjacent cell(s)), an Elex value, and booleans for keeping track of which sides accept flow. Author and date information have been added as a header comment in each of the code files. It just looks odd not seeing the GPL there. I had two alternatives. I could have just created a list of pieces that have been placed on the board, having each piece know its row and column location on the board. That is the method used in many 2D games, where each player and enemy knows its own x-y coordinate position. The approach I took is creating the 2D array of pieces, which represent each cell on the board. If a cell does not contain a piece, then null is stored for that array location. I think the 2D array approach will work better when trying to determine the connections between wires. It’s like Easter eggs in an egg carton. There’s really no reason for each egg to know it’s x-y coordinate. The egg carton just needs to know which egg goes into which slot. The location of the egg can be derived by it’s slot in the egg carton, so it’s really redundant for each egg to also keep track of its position. The 2D array approach shouldn’t be any more memory intensive, since storing null in a cell doesn’t require memory to be allocated. Four new methods have been added to the GameLevel class: confirmButtonPressed, cancelButtonPressed, actionButtonPressed, and optionButtonPressed. These correlate to the A, B, X, and Y buttons on the XBox controller respectively. I wanted to keep everything in the GameLevel class platform independent, and keep all of the platform specific code in the ResistorGame (formerly Game1) class. This will make it easier if I want to add keyboard controls or give the user the ability to customize the controls. Since this is a simple game, the confirm button will be used to drop a piece to the board, and the cancel and action buttons will be used to rotate the piece. Resistors and I wires can only be rotated in two positions. L wires (aka elbow wires) can be rotated in four positions. 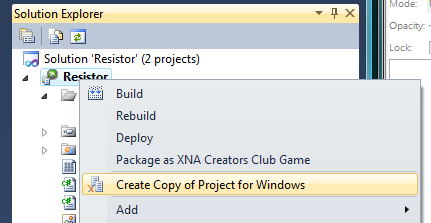 One difficulty that I’m having is that every time I want to test on the XBox (after it has been shut off), I have to Reset All Connections in the XNA Game Studio Connect and remove then re-add the XBox device in XNA Game Studio Device Center using the new code generated on the XBox. I’m not sure if there is a way to keep from having to do this every time. When the confirm button is pressed, I simply add a GamePiece object (just a new one for now) to the GamePiece array in the GameLevel class using the setPiece method, passing the piece, row, and column as parameter. That method simply adds the passed-in piece to the game piece array at the specified row and column. When the draw method is called, it loops through each cell in that array, and if it is not null (i.e. contains a piece), then it calls the draw method on the GamePiece object. Since the GamePiece object will be subclassed, it should correctly draw whatever component it is. For now, it just draws the regular tile using a red shade. One problem that I had to fix was when the user held down the confirm button, then it would continually drop pieces to the board until that button is released. Therefore, I added code to detect when the A button was pressed and released, then only called confirmButtonPressed when the A ButtonState went from Released to Pressed. Found an article which provides an example of how to create a project that will run on both XBox and Windows. It’s fairly simple, because all you need to do is right click the project in the Solution Explorer (the one with the XBox logo icon) and select Create Copy of Project for Windows. The trick is that if you run Debug (F5) while an XBox is not connected, you will get an error about not being able to connect to the XBox. Therefore, you just have to use Build Solution (F6) with x86 selected as the platform. Then using Windows Explorer, dig down to the project > bin > x86 > Debug folder, and the Windows executable should be there. A shortcut to this folder on the desktop will be helpful. Of course, a wired USB Microsoft controller is required as the input device for the Windows build. 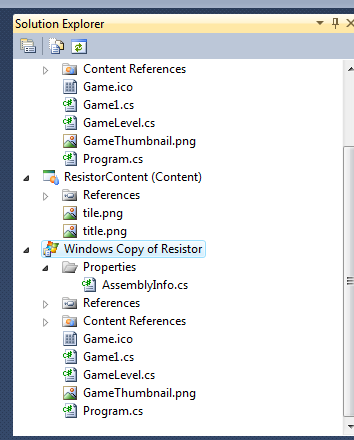 I’m not sure at this time if there is a simple way to get the project to run in debug mode for Windows. Using the Windows build should dramatically speed up the development cycle time, because the XBox system does not have to be running and connected. 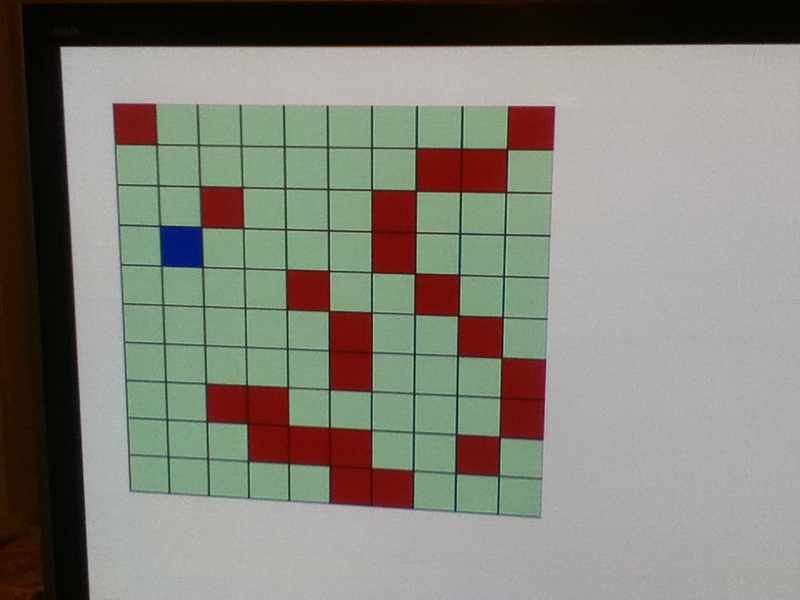 After about an hour of programming, I was able to get a simple cursor moving on the game board. In the game level, I keep track of the current selected cell’s coordinates. I have eight methods which can be called for the four directions (up, down, left, right) for pressed and released. I determine if a direction is pressed or released (just on the D-pad for now) by comparing the current Game Pad state with the Game Pad state from the previous call to the update function. If one of the button states have changed, then I call the appropriate method in the game level class. Basically, I keep an x velocity and y velocity for the cursor, and those velocities are set when a directional button is pressed. The actual selected cell value is updated by the velocity value, if the pause value I have defined is zero, then the pause value is set to a constant number of frames before the cursor is moved again. Without the pause, the cursor will zip across the screen (move one cell for each frame). If the pause value is positive, then it will be decremented by one for each frame until it reaches zero again. 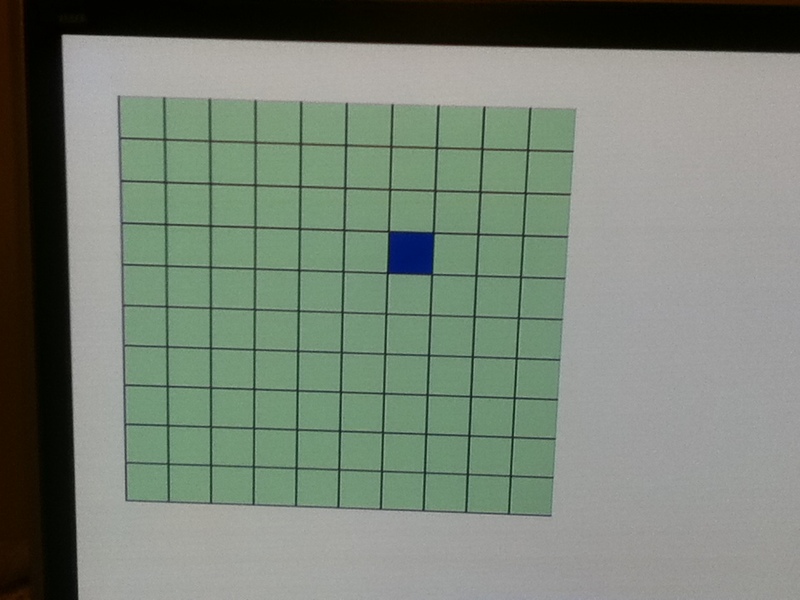 I have set a constant (32) for the cell size in pixels, and I set an x-y coordinate for the offset of the game board. 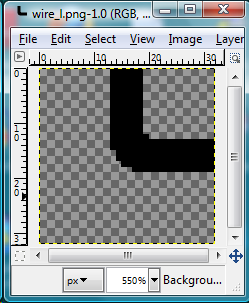 The cursor is just another tile for now, using a blue value for the third parameter when blitting the sprite. The cursor is offset by the selected row times the cell size and the selected column times the cell size. The update function also checks to ensure that applying the velocity value to the cursor doesn’t make the new cell value less than zero or greater than the number of rows or columns. If that happens, then the cursor just retains the old position. This keeps the selected cell from going off the game board. The weekend is over, which means I don’t have much time to develop at night due to work. 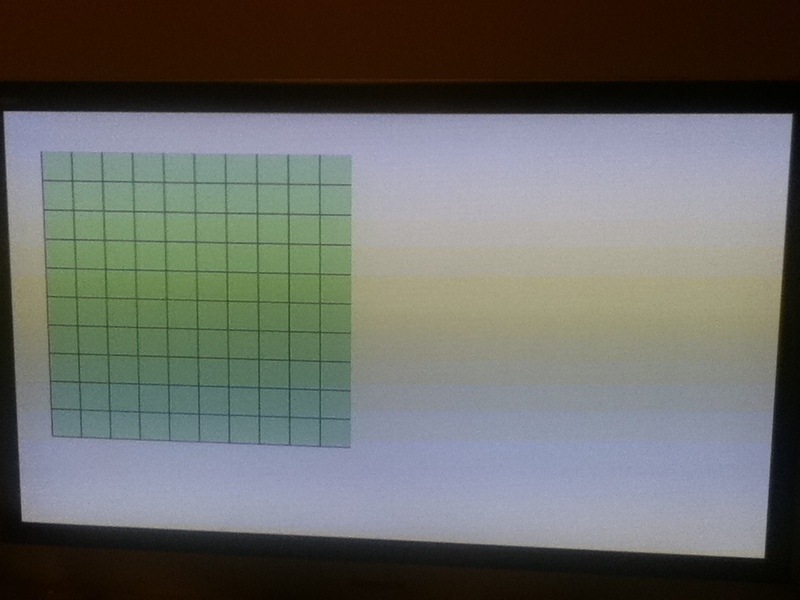 I tried making a simple grid board using lines, however drawing lines in XNA is much more difficult than in graphic libraries I’ve used before, like OpenGL, AWT, Allegro, and ClanLib. I was able to find some documentation on how to draw lines in XNA, but I was just really looking for something to draw a simple line from one x,y coordinate to another x,y coordinate. 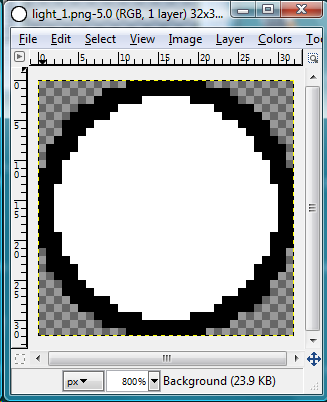 To avoid this complication, I went ahead and created a simple 32×32 pixel tile, with dark lines on the left and bottom edges. I repeated this tile for each cell in the grid, which will be used for the game board. I also created a simple transition from the title screen to the game board screen when the “A” button is pressed on the controller. Additionally, I need to find a way to easily translate my code from an XBox target build to a Windows target build. I would much rather do my simple tests under Windows, and just use the XBox for testing major releases and milestones. Currently, I have two separate projects for building on XBox and on Windows, but it will quickly become a pain to copy source files and resources between the two projects. 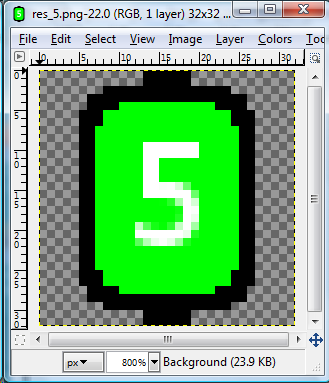 The sprite images for the resistors and wires have now been created in Gimp. I will try to convert these to a sprite sheet later for efficiency, but for now I’m just going to leave them a separate images. Each is a 32×32 pixel image, which should fit perfectly into the board cells. The wires are 6 pixels in width, and centered horizontally so that it will align correctly when rotated. I created resistor sprites for 0 through 9, an “I” wire, an “L” wire, and a light (just a circle for now). Currently, I’m going to make it so that the light can be wired from any side, along with the light output from any side. Finally, I did a little more conceptual level design, which can be seen in the scanned image below. Each level will be composed of multiple stages. Once all stages are complete, the player will move to the next level, which will introduce new pieces or gameplay mechanics. Since this is intended to be a simple game, I won’t actually use the terms “amp”, “electrical current”, or “volt” in the game, but instead just use an lightning bolt icon to represent the units. For simplicity, voltage, current, and resistance units will all be the same. This may upset electronics purists, but I don’t want players to be constantly calculating Ohm’s Law in their head while playing a puzzle game. If the emitter outputs 5 units and it runs through a 2-resistor, then the output from that resistor will be 3 units. For now, I will call this nonsensical unit “Elex” and add a warning about the game not being completely scientifically accurate. Level 1 will start out easy using the lowest resistors, 1 through 3, and only I and L wires. Later Level 1 stages will have the Elex increased from the power source, and the maximum values for the lights will be increased. Again, if the player connects the wire to the light with the Elex value higher than this value, then the light will bust and the game is over. If Elex is lower, then the light will be dimmer based on the current Elex value. Having greater luminosity will result in a higher score at the end of the stage. A perfect bonus will be awarded if all lights are running with the maximum luminosity value. Additionally, in later Level 1 stages the player will be required to connect two lights instead of one. Level 2 will continue to increase the types of resistors used, by including one through nine. Some of the cells may be blocked out to make the player construct more complex paths. Level 3 will introduce the T wire, which is used for splitting. The player will be required to manage two active wires concurrently. Hopefully, I will be able to display the Elex value next to the wire as it fills. Splitting will cause the unit value to split in half for each path. Block cells may be used to force the player to use the T wire. Level 4 will add resistors with two color bands, expanding the resistor values all the way up to 100. An “expert” or “hard” mode could hide the display of the resistor value on the sprite, requiring the player to calculate the resistor value in their head based on the colors. Since this is a game just to teach the color values, the third multiplier band and fourth tolerance band will not be used like on actual resistors. 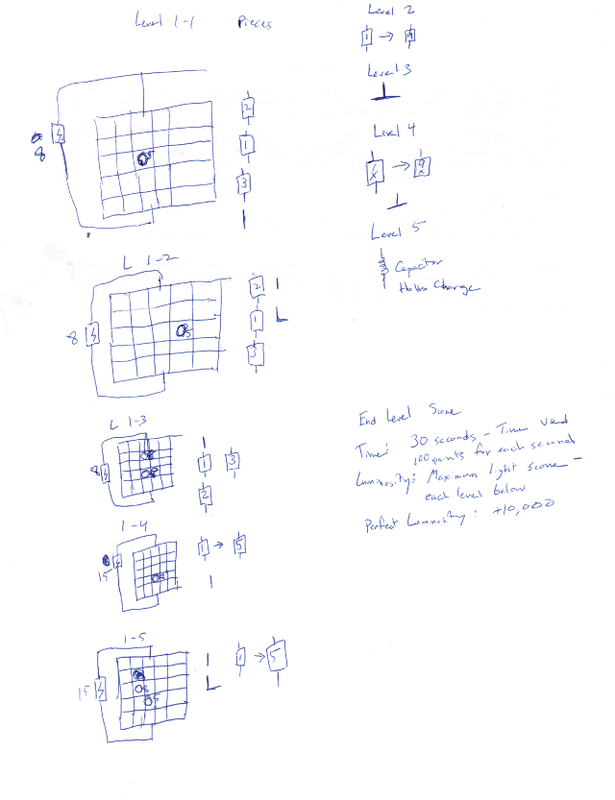 Level 5, if implemented, will include capacitors, but I haven’t thought much about how those will be used in the game. Somehow they will be used to store electrical units.